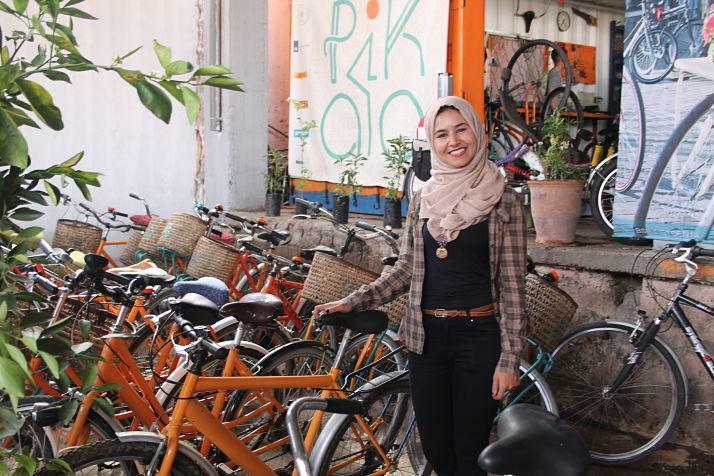 imports abandoned Dutch bikes and brings them to the workshop hub which has just recently been relocated to within Marrakech’s historic, fortified city centre - the medina. 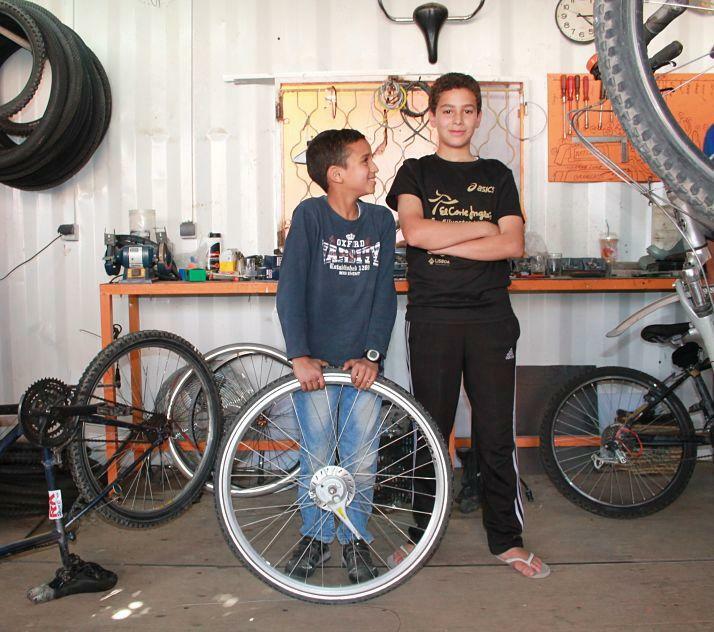 New jobs are created in rehabilitating and maintaining the fleet of bicycles. 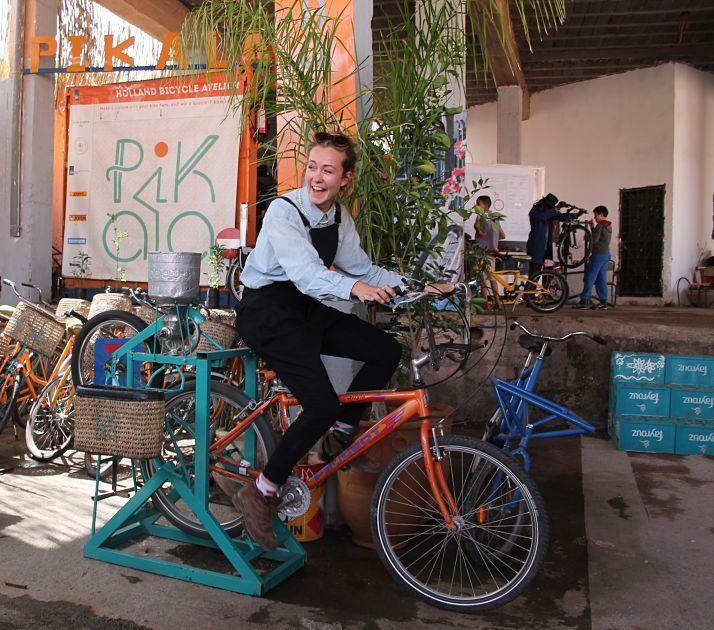 Training is offered to young people in a dynamic environment that is in stark contrast to the dingy neglected spaces that most bike mechanics work in in Marrakech. Traditionally, cycling has been looked down on and a bike mechanic is not a respected job. Bakker sees the work of lifting the image of the mechanic as vital. Seeing tourists on bikes upends stereotypes. Surprisingly for some - there are well off foreigners who want to ride bikes! The fleet of bright yellow machines are available for local people to borrow serving unmet mobility needs. They are also rented out to tourists who are taken on excursions around the city with a tour guide. This is another new source of employment that particularly suits members of the city’s large student population who may be keen to practice foreign languages. It also creates empowering opportunities for young women. Our group of journalists had two guides - Amina Boutbi was very friendly and knowledgeable. I asked about what she liked about being involved - “I get to know new people. I am that kind of girl that is always at home so this is a new experience. It is a way for me to go out of my shell.” The bicycle obviously allows a human to travel a greater distance and move at a faster speed - both useful when seeking to discover a new city. Bikes do other things too. Tourists in the medina can feel harassed by overeager salespeople. White faces and bulky cameras are moving targets for some of the poor population hustling to survive. Once I mounted my metal steed I found my reception subtly shifted. Locals smiled and waved us by seeming to appreciate we were also risking our lives in the traffic and pollution not being transported around in sterile, air conditioned cabs. The smog and other vehicles embraced us from all directions like a flood but it felt different from cycling in London - where I commuted by bike for 15 years - road users are less concerned with traffic laws and more responsive to what is happening around them. The modes of transport are diverse - made up of a wide range of vehicles including donkeys, carts, motorbike tricycles and fast moving mopeds. It occasionally felt dangerous but drivers were very responsive to our efforts and gave way unexpectedly and politely as we made our way. After our day cycling around the medina we had dinner at a restaurant called Nomad that we found deep in the entrails of the market. We arrived having walked through tunnels of stall holders where stepping over a shop’s threshold led to an Aladdin’s cave that could be crammed full of leather bags, lanterns, pointy slippers, jewellery, spices, sweets or textiles. We climbed four stories to dine on the roof as the sun set over the smoking, smouldering mass of the city. As we settled in, the call to prayer echoed out all around us and I was humbled by the strange beauty of this ancient place that still thrives according to traditions started long ago. No structure is allowed to exceed the height of a central minaret, so Marrakech has no tall buildings. From our vantage point, flat roofs lay like patchwork out into the distance. The whole time I was in Marrakech - I never saw any solar PV - generating electricity. There was some solar thermal - making hot water - but not much. Projects like Pikala are taking important steps forward but it is clear there are still immense, as yet untapped, opportunities to bring in new ideas. 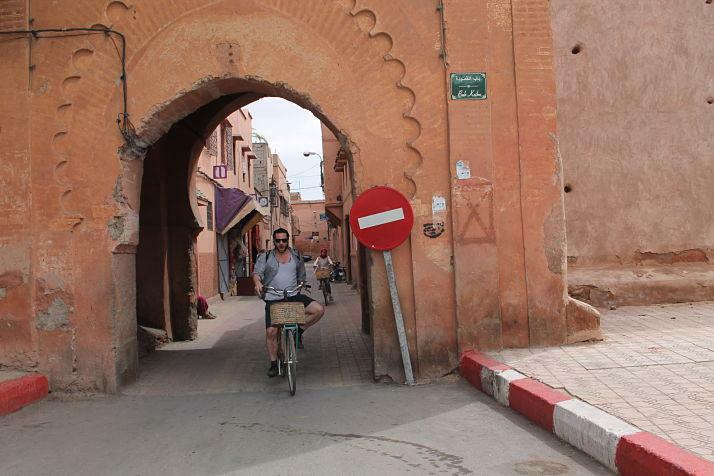 Marrakech has long been a prominent cultural, religious, and trading centre of immense regional importance. For example, Jemaa el-Fnaa is the busiest square in Africa. Changes here will have more then just local importance potentially pioneering the vital shift to clean energy and unlocking the immense benefits inherent in a modal shift to urban cycling across the continent. The enthusiastic participations of so many young Moroccans in this initiative surely means it can only grow and achieve more. The potential of this innovative cultural collaboration is immense. That’s what Flight Free UK is asking, and they have an ambitious target: they want 100,000 people to make the same pledge.